Sourcebooks is in the process of rebranding its editions of Georgette Heyer’s novels. I want to say up front that Sourcebooks performs a real public service in keeping Heyer in print here in the U.S. 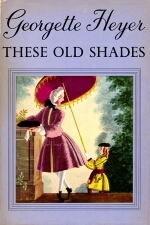 It wasn’t that long ago that, if we Yanks wished to read Heyer’s books and our public library was not well-stocked, we had to comb used-book stores and websites, sometimes paying outrageous prices due to their rarity–Heyer fans tend to hang on to their copies–or import them from the UK at considerable expense. I know that because I did it. 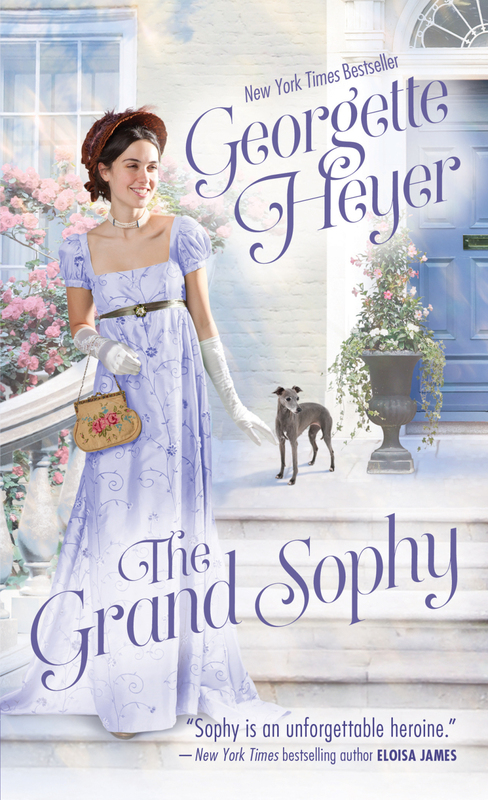 Sourcebooks recently posted on their “Georgette Heyer” Facebook page the first redesigned cover they are launching, for The Grand Sophy, which can be seen at left (you can see it at a larger size by clicking on it). While the illustration is fresh and appealing, it has about as much to do with The Grand Sophy as I do with nuclear geophysics. A gentleman was strolling down a side street in Paris, on his way back from the house of one Madame de Verchoureux. He walked mincingly, for the red heels of his shoes were very high. A long purple cloak, rose-lined, hung from his shoulders and was allowed to fall carelessly back from his dress, revealing a full-skirted coat of purple satin, heavily laced with gold; a waistcoat of flowered silk; faultless small clothes; and a lavish sprinkling of jewels on his cravat and breast. A three-cornered hat, point-edged, was set upon his powdered wig, and in his hand he carried a long beribboned cane. It was a little enough protection against footpads, and although a light dress sword hung at the gentleman’s side its hilt was lost in the folds of his cloak, not quickly to be found. At this late hour, and in this deserted street, it was the height of foolhardiness to walk unattended and flaunting jewels, but the gentleman seemed unaware of his recklessness. He proceeded languidly on his way, glancing neither to left nor to right, apparently heedless of possible danger. I do so love the Duke of Avon. He’s so fabulous. Instead of the Thorn was Georgette Heyer’s first novel with a contemporary setting. Of course, she wrote it in 1922 or so, so that makes it a period piece for our purposes. In fact, it’s a year or two before the current season of Downton Abbey is set, though the characters are middle-class and the plot is darker in some ways. Not in the occasionally silly dramatic-death soap opera way of DA; this feels like real life. In her biography of Georgette Heyer, Jennifer Kloester writes that Heyer was extremely productive in the early 1920s. Along with her books, she was publishing short stories in magazines. These markets were common in the UK at that time and paid well, and Heyer was helping to support her family, so the extra money was no doubt welcome. By combing through microfilm of hundreds of magazines, Kloester found evidence of dozens of these stories, and thinks there are many more that haven’t yet been discovered. 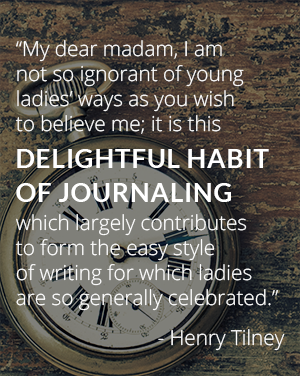 Heyer’s first published short story was republished in in Mary Fahnestock-Thomas’ book, Georgette Heyer: A Critical Retrospective, and I thought it would be fun to re-read it and write a blog post on it. 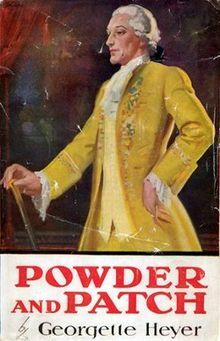 Powder and Patch is not one of Heyer’s best-known or best-loved novels, though it’s very entertaining. It also had an interesting journey to publication–both times. Have you ever read a book and it was kind of awful, but you kept reading it because it had to get better? And then it never does? It pains me to say that about The Great Roxhythe. It pains me to say that about any of Georgette Heyer’s novels. She is a favorite, as the Marquis of Roxhythe himself was a favorite of Charles II, and one does not like to think ill of one’s favorite; but I suppose that every author–even a favorite–is entitled to a dud. And even while I didn’t care much for Roxhythe, it is not a dud, not completely. And even bad Heyer is better than a lot of other books.